Daily Fact: “Brittle” , a flat hardened sugar candy, is thought to be one of the first candies ever made. 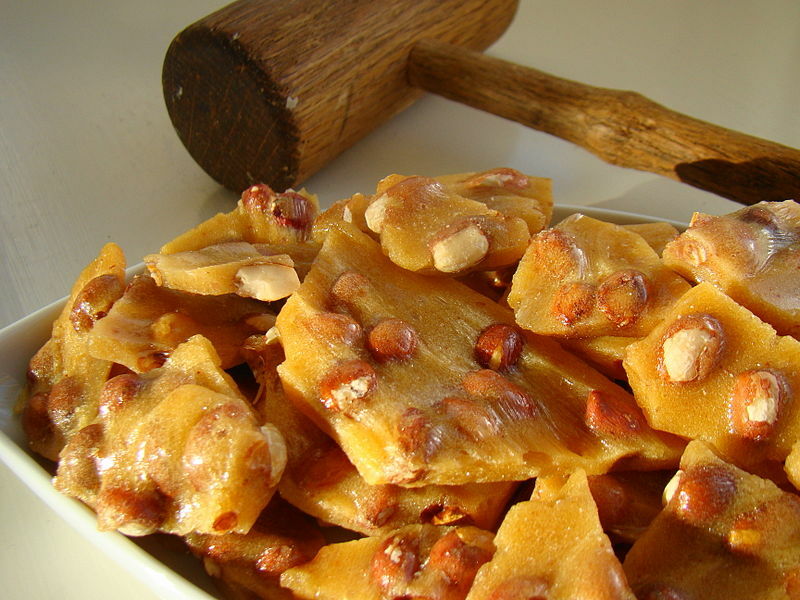 Peanut brittle made with corn syrups & nuts began appearing in cookbooks around the 19th century. 1838 The first state temperance law was passed in Tennessee. 1875 The first battery-powered dentist’s drill was patented by George F Green of Kalamazoo, Michigan. 1932 RIP William Wrigley, Jr. He started Juicy Fruit chewing gum in 1893, & later Wrigley’s Spearmint. Wrigley’s boson became the largest chewing gum manufacturer in the world. 2007 RIP Sharon Tyler Herbst Author of ‘ The Food Lover’s Companion,’ ‘The Joy of Cookies,’ & many more food related books. Brilliant name for your blog! I’m curious how your love of food flourished to such an artistic expression. Thanks for following my blog. As you can see, I don’t believe in dieting, although my main focus is helping people lose weight. I LOVE food and teach others how to live in peace with food and savor each bite. Hey thanks for stopping by! I am really enjoying reading through your posts. Love the history, too! Mmm…peanut butter. Not really a big thing down here in Peru (or outside the US?) unfortunately. you guys are missing it! peanuts actually originted in your region of the world. Really? Well, must not have been around Peru. Here, potatoes are our thing! haha You can’t come to Peru and not hear at least 5 times that there are over 3,000 varieties of potatoes in Peru, etc. Thanks for stopping by to take a look at less & more – I regularly feature simple, easy and gluten-free recipes that my family enjoys. Your blog looks like such a fun place! Enjoy all the good eating! Wow, I always thought Spearmint gum was invented first because it’s so popular! You learn something new every day! I don’t think peanut brittle exists in the UK, it sounds tasty though! Love your daily updates – very cool! And now I want peanut brittle. Good thing the grocery store is on my to-do list today. Great blog! I STILL have brittle leftover from the holidays. I was surprised at how good it was with coconut.Yum! really like your blog, find if very interesting! Peanut brittle is great, love it folded through vanilla ice cream..